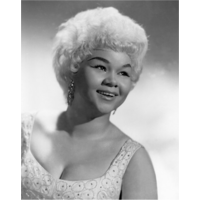 Etta James (born Jamesetta Hawkins; January 25, 1938 – January 20, 2012) was an American singer whose style spanned a variety of music genres including blues, rhythm and blues, rock and roll, soul, gospel and jazz. Starting her career in the mid-1950s, she gained fame with hits such as "Dance With Me, Henry", "At Last", "Tell Mama", and "I'd Rather Go Blind" for which she claimed she wrote the lyrics. She faced a number of personal problems, including drug addiction, before making a musical resurgence in the late 1980s with the album The Seven Year Itch. James is regarded as having bridged the gap between rhythm and blues and rock and roll, and is the winner of six Grammys and 17 Blues Music Awards. She was inducted into the Rock & Roll Hall of Fame in 1993, the Blues Hall of Fame in 2001, and the Grammy Hall of Fame in both 1999 and 2008.Rolling Stone ranked James number 22 on their list of the 100 Greatest Singers of All Time and number 62 on the list of the 100 Greatest Artists.